. 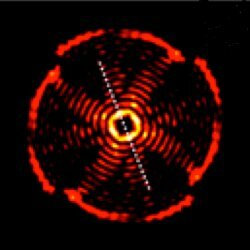 : Optics & Photonics Focus :: Tiny Plasmonic Whirlpools :. A twisted trap. An artist depiction of a nanoparticle optically trapped using a plasmonic vortex. Vortices, including hurricanes, typhoons, or whirlpools, are a common phenomenon in nature. Even light, which is usually thought of as traveling along straight lines, can be twisted into a whirlpool-like pattern, known as an optical vortex. Now, a team of researchers from Korea, led by Byoungho Lee, shows that it is also possible to create tiny whirlpools of plasmons on a thin metal surface and to use them to manipulate microscopic objects. If you throw a stone into a pond, you will observe a ripple that spreads on the surface of the water. A somewhat similar wave is created on the surface of a metal when hit by photons. These electromagnetic oscillations, which propagate for a few tens of micrometers before being absorbed, are called surface plasmons. As it turns out, surface plasmons offer a tremendous opportunity to confine and manipulate light beyond the diffraction limit. This quality has, therefore, led several researchers to consider surface plasmons as a route to optoelectronic devices, which are much smaller than the wavelength of light. In general terms, a vortex is characterized by a spiral motion around a point that is calm and still – think of the eye of a typhoon. Similarly, in optical vortices, there is a calm and still point at the center: light twists around a dark spot of zero intensity . In plasmonic vortices, plasmons twist around a dark spot on the surface of a metal. "At the center of optical and plasmonic vortices," Lee explains, "there is a phase singular point. Here the phase of light cannot be determined and the light intensity is zero. A strong rotational wave flow is surrounding this singular point, so that the field intensity gradient has a maximum in its proximity." The vortex generator. 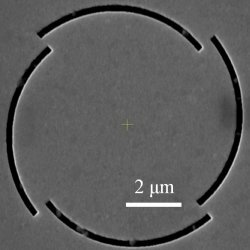 Some circular slits are fabricated on a silver layer in order to generate plasmonic vortices. Are plasmonic vortices different from optical ones? Lee clarifies: "There are common properties between plasmonic vortices and optical vortices. Both of them have a phase singular point at the center, for example. However, plasmonic vortices are a near-field phenomenon so that they are exponentially decaying toward the direction normal to the vortex surface". This means that the intensity of these vortices is strongly confined to the metal surface. Lee and coworkers’ plasmonic vortices are automatically generated when light interacts with four circular slits on a silver layer. The trick is to have the extremes of every slits on two concentric circles with slightly different radii. Because of this variation in distance from the center, the plasmons generated at different points of the slits will also propagate with different phases, thus creating a phase singularity point exactly at the center of the system. 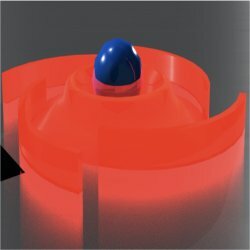 In order to observe the plasmonic vortex, the Korean researchers adopted a technique known as scanning near-field microscopy, where a nanometer sized probe, usually a fine-tipped fiber or a metallic tip, is scanned over the area of interest to collect light locally. The plasmonic whirlpool. A near-field image of the plasmonic vortex lens. One interesting feature of these plasmonic vortices is that they can also be used to create hotspots of light below the limit of diffraction — tiny spots of large intensity. These hot-spots have lots of potential in applications such as optical tweezing of nanoparticles, next-generation integrated optical circuits, and optical data storage, to name a few. At the moment, the most promising application is particle trapping or optical tweezing on thin metal layers. According to Lee, "by changing the polarization state of the incident light, the center of these plasmonic vortices can be dynamically switched from a dark spot to a hot spot. A nanoparticle in the center of the vortex could then be trapped and its scattered light detected." This dynamical switching could be a disadvantage for high speed applications though. In the words of Lee, "it could be difficult to change the polarization state of light with high frequency. On the one hand, this could limit the use of our plasmonic vortices for the optical signal processing area. On the other hand, plasmonic tweezing or trapping of nanoparticles do not demand such a high frequency switching process as optical data communications or pulsed laser generation do." Uriel Levy at the Department of Applied Physics at the Hebrew University of Jerusalem, Israel, comments: "This work is very nice and elegant. It shows how light distribution can be manipulated at the nanoscale by the use of a spiral-like plasmonic lens. Furthermore, light distribution can be switched by controlling the angular momentum of the incident beam. The transfer of angular momentum from free space to surface plasmons may give rise to applications such as nanomotion and nanoengines, optical nanotweezers, and high resolution microscopy." The standard optical vortex lens has already found applications in fiber optics, optical tweezing, microscopy and lithography . In the near future, the hope is that these plasmonic whirlpools will become a tool for concentrating light to limits of which a conventional lens is incapable. Meanwhile researchers will continue to unwhirl the little plasmonic typhoons for their interesting properties.
. G. Molina-Terriza et al., Twisted Photons, Nature Physics 3, 305-310 (2007).
. G. A. Swartwlander Jr., The Optical Vortex Lens, OPN November 2006. SC is a research fellow at ICFO - The Institute of Photonic Sciences (Barcelona, Spain). Hwi Kim, Junghyun Park, Seong-Woo Cho, Seung-Yeol Lee, Minsu Kang & Byoungho Lee, Synthesis and Dynamic Switching of Surface Plasmon Vortices with Plasmonic Vortex Lens, Nano Letters (2010) 10, 529–536 (link).